e-pill MD.2 Automated Pill Dispenser | OhGizmo! By Andrew Liszewski on 02/15/07 • Leave a comment! While I’m not particularly keen on the idea of popping pills for every little ache or pain I understand for some people it’s not really an option, particularly as we grow older. If someone in your care currently has a daily regiment of medication they need to take but you’re worried they may not always remember then an automated dispenser like the MD.2 might be one way to go. 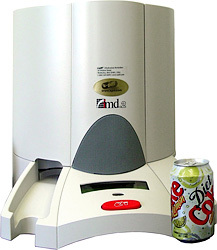 The MD.2 dispenser is currently available for $749.95 with an additional but optional $29.95 a month fee for the monitoring service.